Entry Section | Accumulator | NAKATA MFG. CO., LTD. The entry section continuously feeds strip into the mill. NAKATA selects the best accumulator for your production line. The pass center can be adjusted by the angle of the accumulator table. It is convenient to fit to the existing equipment. Vertical and horizontal types are available for selection, depending on the size of pipes, steel grade and the factory layout. 1. Stable coil strip feed that synchronizes with production speed as it changes. Necessity of Edge Miller which reshapes coil edges is increasing due to the market needs for high quality pipes such as API. NAKATA's Edge Miller can process coil edges at high precision effectively with our proprietary technology. 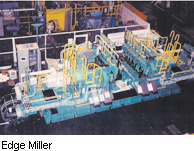 Please ask us about light duty Edge Millers for slit coils, too.